where w induces stretching, while \omega(t) induces random rotations. 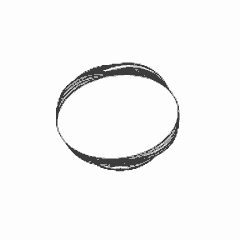 The animation shows the evolution of circular cloud. We have managed to solve analytically how the pendulum spreads away from the unstable position. In particular we were able to calculate the radial diffusion coefficient D_r . Its dependence on the noise intensity D is shown in the figure (analytical red line agree with the numerical points). 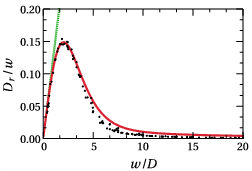 The traditional quantum analysis (green line) is a valid approximation only for very strong noise, i.e. in the limit were the spreading is strongly suppressed.